The Webb Adder - "The Adder". The calculator itself is a populist milestone piece between Pascal's Calculator and Burroughs Adding Machine. Adder Machine Release: 1868, original release. The value of just the decorative pieces on on that bookshelf alone was in the tens of thousands. DO NOT DUPLICATE OR COPY! WE HAVE NO LOCAL ACCESS TO FED EX. SOILING AND CREASES. Antique RC Allen Adding Machine. The crank is a bit stiff as if it needs lubrication. The keys are cracked and worn. All keys and levers are present. All keys are functional and all numbers work. Used condition, it needs a new ribbon. it seams to function. the black roller is cracking. weighs 25 Lbs. Check all pictures. It is in good working order with multiple functions. It has a black and red ribbon that still prints very clearly and also has a 'non print' mode. On the bottom is a number that I believe is the model number. Rare Antique Early GOLDEN GEM 7 Column Adding Machine Working Calculator Patent 1907 by Automatic Adding Machine Co. of New York, U.S.A. This unique Adding Machine is in great antique used pre-owned condition! This wonderful, nostalgic, ORIGINAL, Adding machine is from the EARLY 1900's, Most likely made between 1911-1915 as it only has 7 number colums compared to the later versions that have 8 number colums. This lovely adding machine was in my Grandfather's real estate office in the 1950's. Antique ADDOMETER Portable adding machine Chicago with instruction sheet RARE !! Easy to operate.no practice necessary. If you are looking for the “CHEAPEST”, you are in the wrong place. SO I always choose the “BEST” over the “CHEAPEST” even if it costs more. Vintage Antique Monroe Mechanical High Speed Adding Machine Calculator Rare! Vintage Antique Monroe Mechanical High Speed Adding Machine Calculator Rare!. In good working condition, no cosmetic issues, lable is missing though. Really neat item would go great in your office, for decor or actual use. Will ship next day priority flat rate large box, Thanks for looking! Appears to be in good working condition. Includes paper roll and ribbon spools. In the not to distant past - the red ink was printing - not currently - maybe the spools need reversed or maybe the ink has dried. Antique/Vge Monroe Mechanical Adding Machine Calculator, Portable Carrying Case! I can give "my opinion" on condition and else w/o guaranty. It's very rare to find these with the original leather case like this has. The leather is in very delicate condition and needs to be handled carefully to not break away. Tested and working. Marked on the back June 5 1947. Buttons depress easily and reset with crank. Crank moves freely. I WILL NOTIFY YOU IF THERE ARE ANY DELAY'S. See Photos. All of the keys work. The clear button works. When I add numbers, the correct number is displayed. See the last photo. I put paper where the roll would go. Numbers get printed (however faint). Probably not able to do much in the way of combining due to weight and sizes but if possible I will. Used with wear as pictured. Seems to function as it should. No feet on bottom. This antique is in good condition. Antique Victor Adding Machine in very good condition and working. Some of the ‘1’ keys are worn but adds to the character and look. Ribbon will need to be replaced but you can still see the numbers printing. The glass is intact with no cracks or chips. The ‘1’ key is pressed down, not stuck in pic #1. Check out all of the pics and ask any questions. This item is used but works perfect. We are human, and we do make mistakes and will do whatever possible to correct them for you. THE REST OF IT We will help you in any way possible. not as described – not if you do not like the item. SMITH CORONA. HAND CRANK CALCULATOR ADDING MACHINE. WORK AS IT SHOULD. Very Good - Minor scuffs or scratches, no dents or dings. Good -Normal to heavy scuffing and scratching, a few dents or dings. Score For This Product: Good. 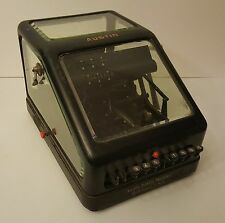 Antique Victor Adding Machine Electric. Protracted By United States and foreign patents m ade in USA. a dding Machine. VINTAGE SMITH CORONA HAND CRANK CALCULATOR ADDING MACHINE METAL SHELL ANTIQUE. Great shape, does have wear and plastic on cord is cracking but still works (see pics). VERY NICE EARLY 1900's ORNATE AMERICAN ADDING MACHINE MADE BY AMERICAN CAN COMPANY, CHICAGO, ILL. THIS ADDING MACHINE IS IN GREAT SHAPE AND IS IN WORKING CONDITION. THE RUBBER GROMMETS ON THE BOTTOM ARE MISSING, PROBABLY FROM AGE VERY COMMON FOR THESE HARD RUBBER GROMMETS TO CRACK AND FALL OFF FROM NATURAL AGEING. "SEE PICTURES FOR MORE DETAILS" MONEY BACK GUARANTEE. "REFUND & RETURN POLICIES". ALL SALES ARE FINAL UNLESS ITEM PURCHASED IS NOT AS DESCRIBED IN THE LISTING OR YOUR ITEM WAS DAMAGED IN DELIVERY. ASK QUESTIONS BEFORE YOU BUY THANKS. IF YOU DECIDE TO RETURN THE ITEM FOR FOR ANY OTHER REASON YOU WILL BE CHARGED ORIGINAL SHIPPING COST AND RETURN SHIPPING COST PLUS THERE IS A 20% RESTOCKING FEE. FREE SHIPPING WITH INSURANCE. ALL ITEMS SHIPPED WITH IN 1 DAY OF PAYMENT. THIS IS A BEAUTY.! original condition hand wheel rubber is cracked. SEE PHOTOS. and you don't even need to ASK Google. to get this answer. And I have no idea if it works or how this works. Burrough's High Keyboard Adding Machine 1908-09 Model 9-119916, Very good condition, Working, Manually operated, on stand w/paper roller, carraige slightly rusted, Green felt top. Multiplication and division can also be done when one knows how to use this calculator. There are plenty of instructional videos on YouTube on how to operate these old machines. weak areas in the power cord have been covered over with electric tape. ANTIQUE UNDERWOOD SUNDSTRAND MANUAL ADDING MACHINE WORKS!! Antique manual adding machine in good working. KEN ADD MACHINES CO. DULUTH, MINN -ANTIQUE ADDING MACHINE. On occasion, it is difficult to find accurate information on individual products. Condition and wear/tear are subjective to each item, and often greatly affect the price of the item. This 500 series with an optional internal motor drive appeared in 1931. Needs some work but could easily be refurbished. Such a great piece of history! In 2018 Victor celebrated their 100th anniversary. There are total and non-add keys left of the number keys and a repeat key on the right. The total key also clears the machine. There are nine type bars, eight for digits and one for special characters. Antique Remington Rand Adding Machine M127624 Art Deco In Excellent Wkg Cond!